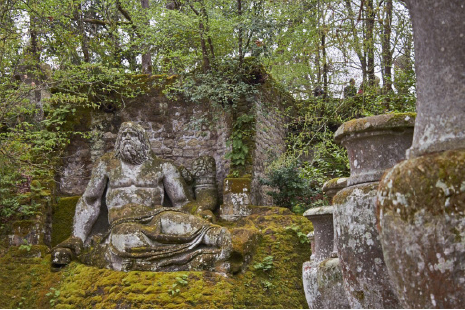 Tucked away in the Medieval Italian town of Bomarzo, around 100 kilometers north of Rome, lies an exceptional forest dotted with colossal mythical creatures and optical illusions that make one think of Alice in Wonderland. Sacro Bosco (Sacred Woods), also known as the Park of Monsters, is a breathtaking fantasy forest and arguably the world’s first theme park. Build in the late 1500s, Sacro Bosco was the vision and creation of a noble patron, Duke Vicino Orsini. As he was grieving the untimely passing of his beloved wife, Giulia Farnese, he was driven to make something truly special in her honor. To carry out his ambitious ideas, Orsini commissioned Pirro Ligorio, the best architect around at the time. It was he who had finished work on the St. Peters Basilica in the Vatican after the death of Michelangelo. Using mammoth blocks of peperino (a greenish brown volcanic rock), and at times the existing bedrock of the massive garden, Ligorio worked for many years. The result of his labor was a spellbinding maze of stone figures with no particular rationality in their positioning or theme: You will come across a huge elephant crushing a Roman soldier in a re-enactment of Hannibal’s journey over the Alps, a massive ogre with its mouth menacingly wide open, and Pegasus rising from a fountain. 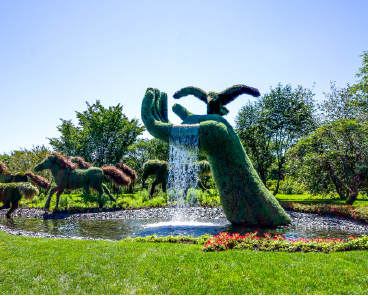 There are also sculptures of a giant turtle, a mermaid, winged horses, sea monsters, Neptune, giant wrestlers, a whale, and a sphinx, among other curious stone figures. Then all of a sudden you will encounter a comical tilted house that does not fit in with the mythical theme, making it quite a fascinating labyrinth with no clear explanation for the visitor. There are, however, some random inscriptions that might provide some clues. One inscription on an obelisk says that the area is sol per sfogare il Core (“‘just to set the heart free”), while other sculptures have allusive verses by various famous Italians from the 16th century, many of which are now eroded and hard to read. 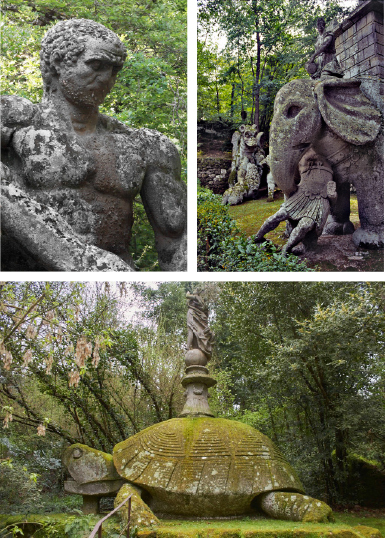 Many people claim that the park of Bomarzo was not created to please but rather to shock people, and perhaps it even served as a symbol of opposition to the immaculate symmetrical gardens of that time, such as the nearby Villa Farnese and Villa Lante. 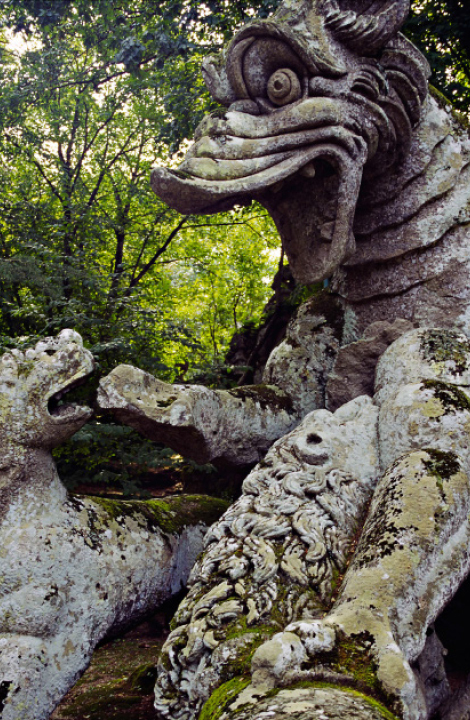 After a long period of neglect spanning the 19th and 20th centuries, the park was beautifully restored and reopened to the public in the 1970s, with the new nickname “Park of Monsters.” Today it is widely appreciated as a mesmerizing green sanctuary that blends ancient mythology and fantasy. 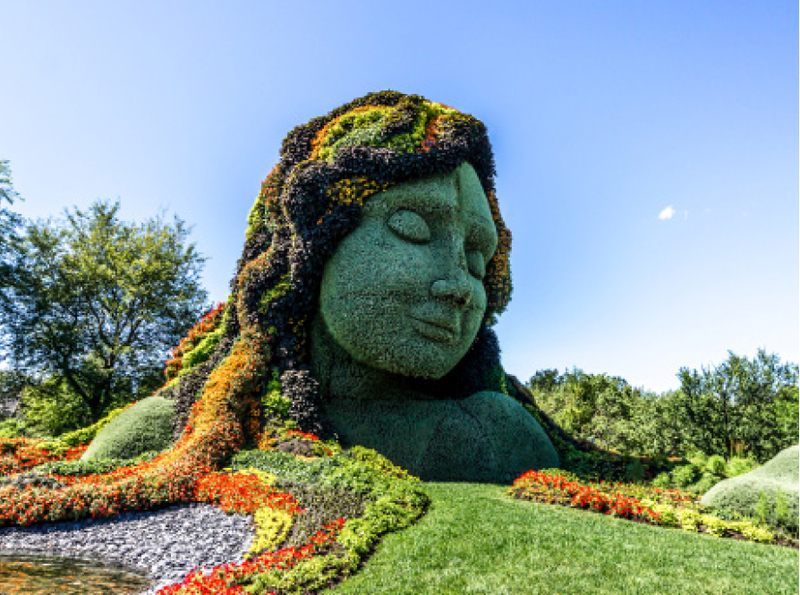 Instead of carvings on stone, sculptures generated from different plants were featured at the Mosaïcultures Internationales Montréal exhibit at the Montreal Botanical Garden. 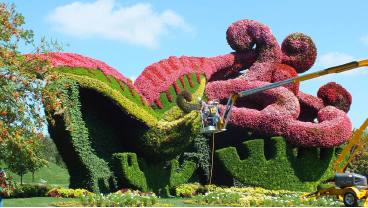 This exhibit consisted of 50 spectacular horticultural sculptures from around the world. The stunning works of art reflected the culture of its participant and carried an important environmental message illustrating how humans, animals, and nature interact with one another both in the past and present. A shepherd guarding his sheep, a medieval pagan god, Mother Earth, a dance of cranes, and endangered orangutans and birds, were just some of the nature themes that were represented. 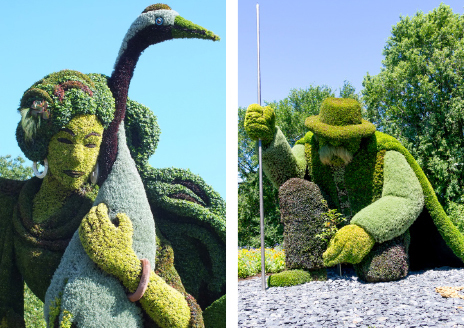 The beauty, attention to detail, and artistry of these botanical sculptures is truly impressive.